As a result, the prefecture announced on November 15 that it is considering revoking the permission to use Oku Port for transporting materials for the new base construction. Oku Port in Kunigami Village has been used for transporting materials by sea for the seawall construction for the new Henoko base, also known as the relocation of the U.S. Military Futenma Air Station. On the same day, the prefecture requested that the Okinawa Defense Bureau file the paperwork to stop the maritime transport using the Oku Port and change the approval status. 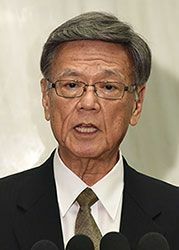 Governor Takeshi Onaga who had a press conference that same evening said, “We were unable to make the Oku residents aware that the dump trucks would be contributing to that much dust on the roads. After permissioning to use the quay wall and land for port facilities in September, the prefecture created the “Standards for Screening the Permission to Use the Land for Port Facilities” on November 7. It seems that the prefecture is considering revoking the permission by applying this regulation and not permitting an application for renewal. Regarding the commencement of maritime transport, Governor Onaga criticized the situation by saying, “We had given administrative guidance to hold off execution until the negotiations were done with the prefecture. The permission to use the Oku Port was given despite the prefecture employing various methods to prevent the new base from being constructed. As a result, there is growing opposition by citizens who are against the new base. Regarding this, Governor Onaga said, “My feelings are exactly the same as the citizens. Governor Onaga thereby acknowledged the criticisms toward him. Regarding the timeframe for which the landfill approval will be revoked, Governor Onaga said, “I will take responsibility.